Writing content for presentations: how I usually do it. The first thing I choose to reblog. It teaches us how to make a good presentation that sells. If you ever need to give any presentation, please take a moment to read it. 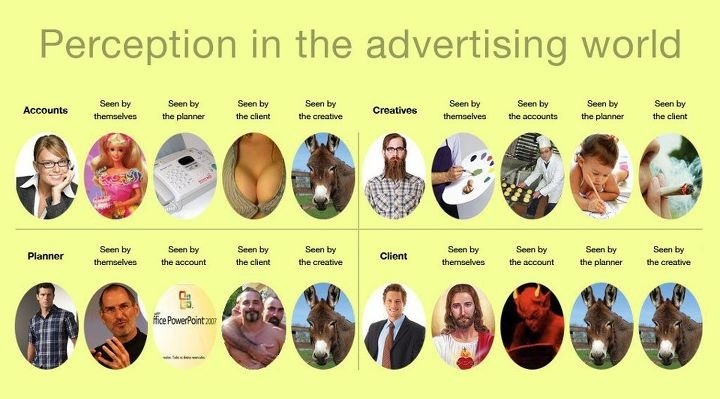 A friend of mine (he doesn’t work in advertising, but as a market research manager he works frequently with advertising people) shared me this picture around few months ago. I work as a planner, and as you can see from the picture some of my colleagues see me as “the PowerPoint monkey”. This means, in their eyes my main role is to churn out good-looking, smart-sounding slides for presentations that will make clients see the agency knows what it’s doing. That perception is not entirely inaccurate, though. I deliver presentations and produce slide shows on a weekly basis. But I honestly believe that presentations are not about slides. In fact, I have strong certain beliefs about presentations, and I have a method I always use whenever I have to prepare for one.